– 8 parallels to chase, including the Hobby Exclusive Orange Border! 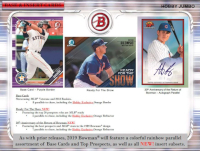 – 5 parallels to chase, including the Hobby Exclusive Orange Refractor! – 7 parallels to chase, including the Hobby Exclusive Orange Refractor. – 5 parallels to chase, including the NEW! Atomic Refractor. – 7 parallels to chase. ROY Favorites Autographs: – Highlighting top 2019 rookies with a limited edition autograph card. HOBBY SKUs ONLY! 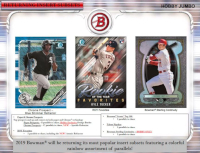 Dual Bowman Prospect Autographs: HOBBY ONLY – Featuring a rare 1-of-1 Superfractor!